Leadership board member Michelle Z. shared this image, noting that it's been circulating on Tumblr. These analogies only work if you avoid those pesky "difficult concepts" from science: concepts like fertilization, species classification, and biological development. 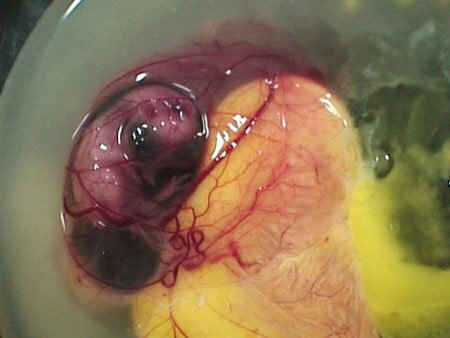 If you were to break open an egg that was fertilized, you'd reveal something rather unfamiliar to your breakfast table: See the beak and the tiny little bird foot? Chicken. Very young chicken, but still chicken. Let's move on to the acorn. "An acorn is not a tree" is one of the oldest, easiest-to-refute, unoriginal, nonsense pro-choice statements in the book. It relies on a simple linguistic confusion. The word "tree" can be used in two subtly different ways. One use is to designate species: oak trees, pine trees, etc. Another meaning designates the adult stage of the plant, as in "I planted a sapling last August, and now it's a tree." An acorn is not an adult tree. It IS a member of its species: oak, pine, or whatever the case may be. Likewise, unborn children are human, but they are not adults (and obviously, pro-lifers have never claimed that they are). The silkworm example is just ridiculous. Of course a part of the raw materials used to make a dress is not a dress. But embryos and fetuses are not "raw materials" for making people. The raw materials are the nutrients that we ingest-- prenatally through the umbilical cord, in infancy through breast milk or formula, and so on. We don't "come from" unborn children; we once were unborn children. This brings us to the final image. It appears that this image depicts a moment just before fertilization; the sperm hasn't yet gone in to mingle its DNA with the egg's DNA. So, ironically enough, the pro-choicers are actually right about this-- just not for the reasons they think. But let's pretend that it were really an image of the moment of fertilization. Human fertilization (also known as conception) creates new members of the human species. Newly conceived human beings are of course not adults yet, but neither are they mere raw materials. They are simply young, and look exactly how they are supposed to at this stage of their lives. At conception, they possess all the genetic information that will guide them through the prenatal period, infancy, childhood, adolescence, adulthood, and old age. Every person, including you, can trace back his or her existence as an individual to this event. Pro-lifers are at a disadvantage here. In general, people tend to prefer simplistic ideas to ones that take more time to explain, even if the latter has science on its side. The abortion movement has made very good use of misleading images and language. It's up to us to improve public understanding, one person at a time. Please share this post with your friends. Chinkle is right about chickens. The unfertilized egg of a chicken is like an ovum released during menstruation except that it includes the nourishment that isn't needed by mammals which get theirs from their mother. The fertilized chicken egg in your picture happened not because the rooster wasn't kept away from the eggs, but because the rooster wasn't kept away from the hens. Phil sounds interesting. I wonder what his basis for ascribing moral rights/status to animals is. Many animal rights advocates subscribe to a moral theory which (counterintuively) permits prenatal homicide but prohibits killing nonhuman animals. FYI: There's an interesting ethical argument to be made which analogizes the acorn to FROZEN embryos, and therefore makes acorns a serious issue for prolifers opposing embryonic stem cell use. Acorns, however, are totally irrelevant to abortion, just as you say. Also - typo on "simplistic". I agree that the arguments you're demolishing are overly simplistic. But your own explanations aren't much better. Sure, you can say an acorn is a young tree, but defining it as such doesn't change the fact that most people would feel very differently about plucking an acorn out of the ground and chopping down an ancient oak. Similarly it's true that the fertilised egg contains all the genetic information required to make a person, but then so too do any human ovum-and-sperm pair - in fact they contain enough information to make many different people - so what? Does this mean we should conserve all ova and sperm? The fact is that it is the interaction of those genes with the environment (including their own mutual interactions and most particularly including several months in a womb or womb-like environment) that eventually creates a person. Choosing to define the creation of a person as being at the point of fusing of ovum and sperm is simple and clear, but is still essentially arbitrary. You're going to have to come up with something more compelling than your dictionary definitions of words. Perhaps people's feelings are irrelevant. In the end you still have a tree whose life was stunted. It's easier to engage in a harmful activity when one cannot grasp the actual effects of their actions, especially when gaps in time and space are involved. I am not so willing to look at the consensus of human feeling. But I am concerned with the fact that anything identifiable as a distinct human life should be treated much differently than a distinct tree life. I am also under the impression that viability is harder to reach for trees than for humans meaning "adult" life would be more sure for the child. This yet unborn person is fundamentally different from any sperm/egg pair. It is a single unit storing all the information for a human. If half of you was in one place and half in another of course it would be impossible to say that the two halves somehow constituted a person. But when one body contains all the information, it's a different ball of wax. It's a new human life, a person. Ha Ha -- if you don't plant a seed, you cut the tree down. If a bird devoured a caterpillar it killed the butterfly. If the zygote did not implanted in the uterus the mother murdered a child. so Fooliish, this is the way a hubris argues! "In General, people tend to prefer simplistic ideas to ones that take more time to explain, even if the latter has science on its side"
Wow, hypocrisy much? You who claim "It has (heartbeat or neural activity or distinct DNA or whatever), that means it's a human being just like that!" are criticizing people of simplifying things? You don't have science, you have jargon. You're putting on a lab coat and marching around playing at a scientist. The scientific definition of life is NOT on your side. The scientific community is NOT on your side. Can you link me to a scientific source that says biologically human beings begin as something other than zygotes? imilarly it's true that the fertilised egg contains all the genetic information required to make a person, but then so too do any human ovum-and-sperm pair - in fact they contain enough information to make many different people - so what? Does this mean we should conserve all ova and sperm? A human ovum is a cell. A human sperm is a cell. Neither one of these cells are organisms. When these two cells meet through the process of fertilization, an organism is created. Just as the expulsion of either the sperm or the ovum separately does not constitute expulsion of human organisms, i.e. human beings. Killing a skin cell does not constitute killing your existence as a human being. Look at it this way: your actual existence does not necessarily extend to the sperm that created you because you did not exist before your father's sperm cell fertilized your mother's egg cell. After fertilization, both the sperm and the egg cease to exist from a biological standpoint. At this point, there constitutes a distinct beginning to every individual human being's existence, and that point, which is 100% supported by biological fact, is at fertilization. If you're still confused, please read your local school district's issued biology book. They will all tell you roughly the same thing about any sexually reproducing animal or species. You: "Similarly it's true that the fertilised egg contains all the genetic information required to make a person, but then so too do any human ovum-and-sperm pair - in fact they contain enough information to make many different people - so what? Does this mean we should conserve all ova and sperm?" Me: A human ovum is a cell. A human sperm is a cell. Neither one of these cells are organisms. When these two cells meet through the process of fertilization, an organism is created. Just as the expulsion of either the sperm or the ovum separately does not constitute expulsion of human organisms, i.e. human beings. Killing a skin cell does not constitute killing your existence as a human being. Look at it this way: your actual existence does not necessarily extend to the sperm that created you because you did not exist before your father's sperm cell fertilized your mother's egg cell. After fertilization, both the sperm and the egg cease to exist from a biological standpoint. At this point, there constitutes a distinct beginning to every individual human being's existence, and that point, which is 100% supported by biological fact, is at fertilization. If you're still confused, please read your local school district's issued biology book. They will all tell you roughly the same thing about any sexually reproducing animal or species. I know this is old, but I stumbled across it, and just had to say something. This meme is currently making the rounds again, and I still think it's a good one. Your deconstruction overshoots the point of the whole thing. An acorn ISN'T an oak tree. Countless acorns never become trees, are eaten by squirrels, rot away, or fail to take root. You'd never say a squirrel ate an oak tree. Chicken eggs--even when fertilized--are not yet chickens. If the egg you pictured were broken at that point, earlier, or shortly after, it is unlikely that most people would think you killed a chicken. A POTENTIAL chicken sure, but not a chicken. The silk one is a little sillier, but still to the point: this is an early stage of silk. If you destroy this fluff, you haven't destroyed a $1300 Versace. And the last one is even better. A newly fertilized egg (and we don't know that one is HUMAN, do we?) is NOT YET a person. It is a potential person. Countless fertilized eggs fail to implant, miscarry spontaneously, or are sitting in petri dishes in freezers in fertility labs. In any of those cases, you'd have to be a bit nutty to think that if the zygote were destroyed, that a murder had been committed. Abortion is totally NOT my issue, and I'd be the first to say that WHERE to draw the line is a difficult thing. But a newly fertilized egg is NOT a person. Not yet. Argue about WHEN that happens all you like (the Bible, interestingly, implies that BREATH is life), but don't tell me that last picture is a person. And don't pretend you don't "get" what this analogy is about. Your explanations are just........dumb. seriously. They make no more sense than the "pro-choice" people you're trying to oppose. Except you are wrong because biological evidence supports the fact that fertilized eggs are NOT organisms. If you look at the definition of what you need to be considered as an organism (a fertilized egg lives, like any cell but it is not alive) you will see that you need to be independent enough to function and develop on your own rather than using some other organism to fulfill certain functions. It is why viruses are not considered as organisms and neither are foetuses (at least not until several months). And there is a huge difference between feeding a baby and digesting food for a foetus. You can read Dr Kaplan's book on that subject. Even President Biden agreed that life begins at conception. 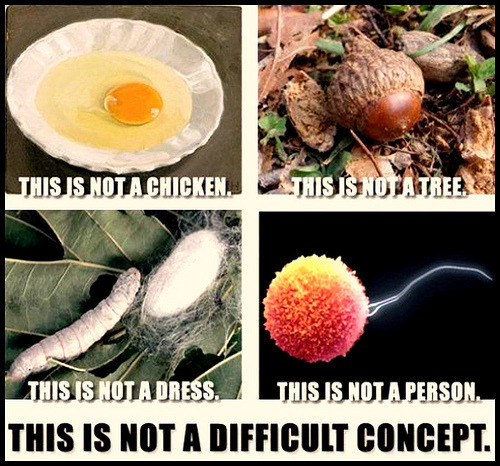 These three arguments are silly because an egg, an acorn and silk are not human babies! A fertilized egg is! Life begins at conception, thus abortion is murder. For murder is the intentional taking of a human being. By the way, thank you so much Secular Pro-life for helping us walk through this treachery of Roe vs. Wade. It lives but is not alive but if it lives then how can it not be alive? A fetus is made of living cells, has an energy metabolism, produces waste products and responds to stimuli and there have been aborted female fetuses that have been harvested for their eggs and used to create embryos for infertile couples. However viruses are acellular particles that do none of the above and requires a cellular host in order to replicate. Still, you are right that there is a huge difference from a fetus depending on mom for nutrition through her bloodstream and nursing a child, just like there is a huge difference between nursing a child and feeding a child baby food, then table food and then being grown and able to go out and work and buy their own food and no longer depend on mom. The fact that a fetus depends upon their mother for nutrition that is delivered through mom's bloodstream does not make it a parasite because for one, the human fetus is of the same species as mom and for another, the fetus and mom share a symbiotic relationship. Based on your logic, should we extend the choice for abortion until a child is 18 based on the different requirements for feeding stages? So, we say an unborn child is a human life, and to make fun of us they say, an unfertilized egg isn't life, and yes it isn't just like an unfertilized human egg isn't, an acorn isn't wood, but it is so total fail there, a silk worm isn't silk, hard to argue with that one I think you got me, I suppose its true a human isn't a lampshade although we can make lampshades from them, and lastly an individual sperm isn't a human, true, I guess we don't argue that an individual blood cell isn't a human either so not really sure what your trying to say... Biology isn't your strong suit is it? You could be right about the viability of the tree but trees produce millions of seeds or acorns, so they always have the chance of at least several offspring. Whereas humans usually just produce one or two at a time. Not saying we should neglect either though. Midori, did you ever take Bio 101? I would highly suggest it. I personally find it quite interesting and know for a fact that it states the oposite of what you're claiming. Just try it. Might be fun for you. You are one of those that is confused between something coming from something else, and something merely being in one developmental stage and continuing to it's next. Classifications of species tells us an acorn IS a tree, for the reasons explained in the piece. An acorn is an immature tree, a fertilized chicken egg is an immature chicken, and a preborn human is an immature human. You may call all these things exactly that and you would be correct. I would suggest re reading this article again, sometimes we understand things better the second time around. If you still don't you're problem isn't with this post or the poster, it's with science. Agree, science tells us when life begins. Biologically "life" has a very distinct meaning. To claim someone isn't 'alive' because they don't have brain waves yet or fingers or a personality is to put a non scientific, subjective view on someone. Those views/non scientific opinions should be left out. Opinions do come into play on whether or not these live preborn humans should continue to be allowed to be discriminated against, and if so in what ways (such as should they be allowed to be killed for any reason, not at all, or only at a certain gestational age, etc)? Whether life has value or not, whether a person has value or not is a philosophical question. I believe we have already answered that question though since we have laws that punish people for killing others. Ergo, for some humans to be treated unfairly based on their looks/stage of development is as I said, discrimination. Yeah I took a biology 50 course in college last year (made to take a refresher ) and the first chapter states how all cells show all the properties of life. Meaning all of us were alive from the moment we came into existance. ISBN10: 0321772598) published in 2012. It even touches on the reclassification of dinosaurs as aviary so I wouldn't think it's information on the properties of life would be old? Um did he just say a fertilized egg was living but not alive? Well put Star :) All living things are made of cells, which DO function independently as well as display the other properties of life. I think there is a disconnect with some people not grasping that we ARE our cells. Even our brain (which I theorize is where we get our personalty) is made of cells.